Gluten free dog food is widely available and people are feeding it to their dogs for a number of reasons. Dog food without gluten is considered to be hypoallergenic and is often prescribed for dogs with allergies. Perhaps the most important feature of any dog food is that it must be nutritionally balanced so your dog gets all the nutrients that she needs. So who are the dogs that need gluten free dog food? I see a number of articles online talking about dogs with celiac disease and their need for a gluten free diet. But there is a problem with this. Celiac disease is extremely rare in dogs, if it even occurs. In fact, the Merck Manual for Pet Health, an authority for animal health, doesn’t even mention celiac disease in animals. This version is for laymen. Celiac disease is a human issue, not a canine issue. On the other hand, there are dogs who benefit from a gluten free diet. Some dogs do develop sensitivity to certain dog foods. When a dog is sensitive to gluten, he is usually sensitive to wheat or corn. But not all dogs. Some are actually allergic to one or more of the other ingredients. Usually a dog allergic to food is allergic to the protein source in the food. This can be either meat or grain. Dog allergies to food develop over time. It usually takes about two years to develop an allergy to a certain food. This explains why a dog who has been healthy, develops symptoms all of a sudden. Symptoms of food allergy can present in different ways. It may take both you and your vet working together to determine if your dog has allergies. In fact, Weimaraners are dogs who often end up with allergies and sensitive digestive systems. If your dog is constantly itching, scratching and biting himself, check to make sure that he doesn’t have fleas. If there is no obvious reason for his behavior, consider food allergies. Dogs with allergies sometimes have chronic ear infections. If you clean your dog’s ear regularly and keep them free of hair, his ear infections might actually be allergies. Another seemingly unrelated issue could be vomiting or diarrhea with no other known reason for them. You may have to experiment a little with your dog’s diet, as there are no easy medical tests or blood tests to determine if your dog is allergic. Gluten free dog food can be yummy! How do you know which gluten free dog food is best for your dog? If your dog has been diagnosed with dog food allergies, you will need to find another food for him. There are many good, natural dog foods on the market. 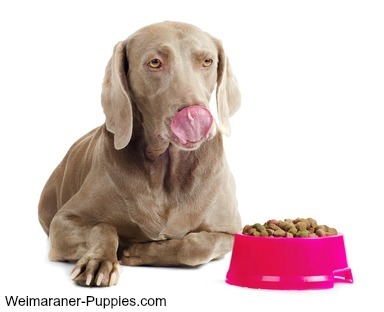 The best way to determine which food is best for your allergic dog is to try a new food. When you do this, you need to give each gluten free dog food a few weeks, so that you will know how your dog is doing. If she does really well with it–stay with that hypoallergenic dog food! A word of caution. Do not change your dog’s food to avoid allergies! Veterinarians believe that the more protein sources that you expose your dog to, the greater the chances that she will be exposed to an allergen. Then she will have an allergy! If your dog is feeling good and acting healthy, let well enough alone. Basically it works like this: Gradually switch your dog over to the new gluten-free dog food. You might start with 1/4 new food to 3/4 old food. Then keep increasing the new food and decreasing the old food. 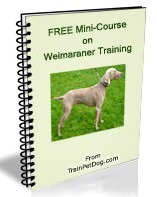 Give your Weimaraner the new gluten free diet for 12 weeks. Make sure you give him plenty of water, as well. In addition, make sure you don’t give him treats that contain gluten, or you will be defeating your efforts! If the symptoms are reduced after 12 weeks, then switch back to the original dog food. If the symptoms re-occur, than you have successfully diagnosed a food allergy or intolerance. A gluten free diet for your dog just may be the solution to your dog’s health problems!